You don’t have to go to your favorite steakhouse to get a good meal — you can make one at home, and it’s easier than you think. 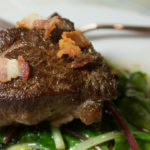 This beef tenderloin cooked with bacon and served with garlic-flavored greens is filling, delicious, and the perfect dinner in. If you’re anything like me, you like to have at least one more side with dinner. My boyfriend would argue maybe two or three 😉 The greens make a nice addition but might I also suggest some mashed sweet potatoes – if you have room for the carbs – or cauliflower tabouli. Heat a large, heavy skillet over medium heat. Add the bacon and cook until crisp. Remove with slotted spoon. Add the clarified butter to the skillet, season the steaks with salt and pepper and add them to the pan. Cook until done to your liking, flipping just once. Remove from pan. Add the garlic to the same pan, cook for about 30 seconds and stir in the greens. Stir and cook until wilted and add the lemon juice. 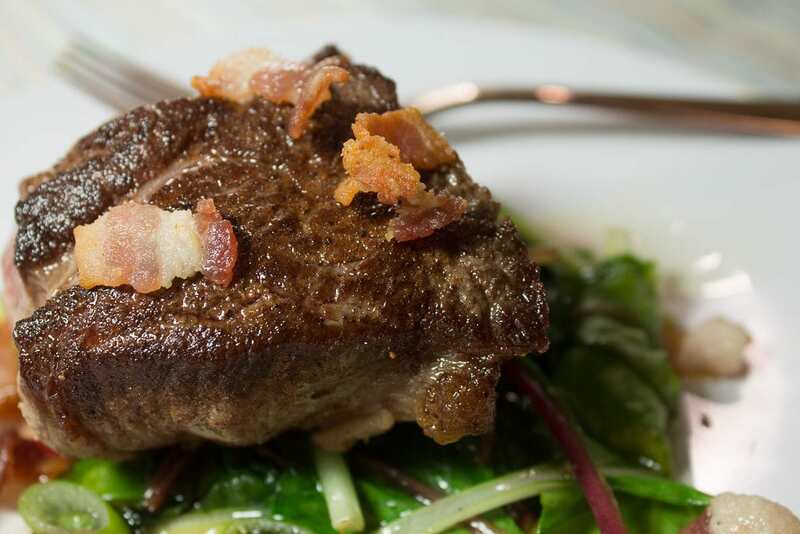 Serve the steaks with the greens and sprinkle with the reserved bacon.